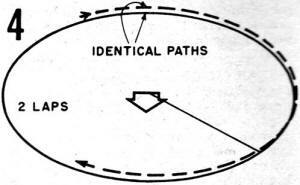 The control line stunt pattern in effect for 1957 is shown in this article from American Modeler in that year. The stunt pattern has undergone numerous changes in the past many decades, so competition flyers have needed to keep abreast of the most current rules. Airplanes have undergone many changes as well, partially driving the rules changes. 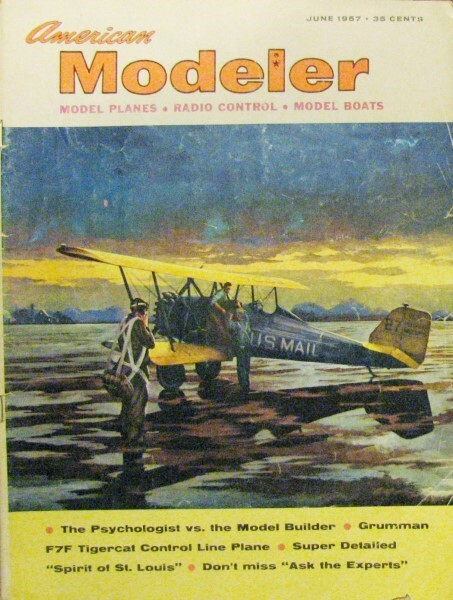 There are now official contest events for Old Time Stunt (OTS) that use models and a pattern from prescribed eras: "Old-Time Stunt models are those designed, built, flown and/ or published before the last day of 1952; Classic models are the models categorized with the same criteria but before the last day of 1969" (per the AMA). A big change from then until present day 'Control Line Precision Aerobatics' is the awarding of up to 20 points for appearance. I suppose that is partly to reward builders for daring to actually fly their best models rather than keeping them as Hangar Queens, with an occasional flight with low risk maneuvers. Scale builders have to fly their best work, but then they are not expected to perform clover leafs with them. Another noticeable change is the elimination of the climb and dive maneuver. 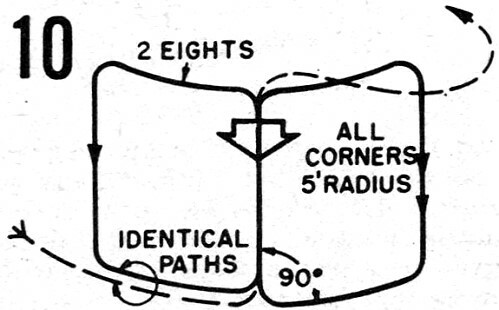 Exciting news for control line modelers are the AMA's 1957-58 stunt regulations. 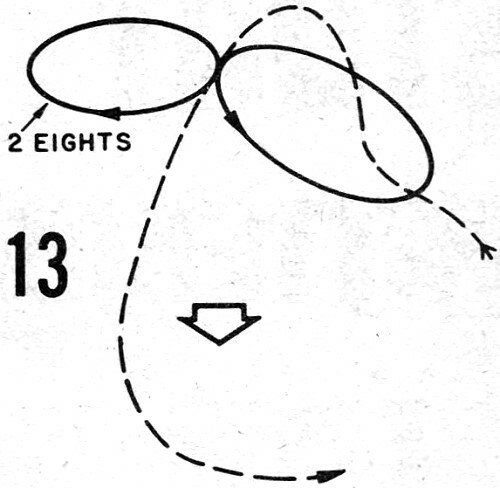 We present here the new flight patterns and a briefed version of the rules. All maneuvers are scored on basis of maximum 40 points, minimum 10 points unless otherwise listed. A complete new rules book may be had from the AMA for 25¢; it contains all events. Starting: Take-off within 1 minute from time prop is flipped, 5 points; starting after 1 minute, no points. Take-Off: Correct when model rolls smoothly along ground for not less than 15', rises smoothly into air with gradual climb, smooth level-off at normal flight altitude. Model continues for 2 smooth laps of normal level flight to point of original level-off. Diagram # 1. Reverse Wing-Overs (1 Req'd. 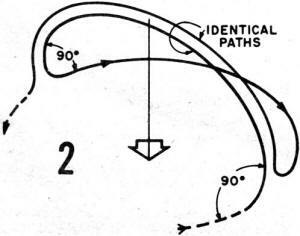 ): Correct when started from normal level flight, makes vertical climb and dive, passes directly over flyer's head, cuts ground circle in half, recovers in inverted position at normal flight level. Continues for half lap inverted to starting point, makes vertical climb and dive over center of circle from inverted flight, recovers in normal level flight. Diagram #2. By tracing the drawing above on clear plastic in black india ink, you achieve a 3-dimensional type of illustration by superimposing it over each stunt - just cover the white guide arrows with the black one. Illustrations are for counterclockwise flying (from your right to your left) and as viewed from outside the circle as you face the flyer. Errors: First Half-Starts at other than normal level flight, wobbles, mushes into climb. Does not cross directly over flyer's head. Does not cross circle in straight line. Wobbles, mushes or recovers at other than normal flight level inverted. Does not cut circle in same position and direction in 2nd part. Second Half-Scored same as first, reversing entry and recovery positions. 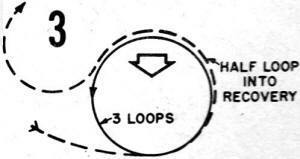 Consecutive Inside Loops (3 Req'd. ): Correct when started from normal level flight; makes 3 smooth, round loops, all in same place with bottoms at normal level flight altitude and tops with line(s) at 45°. Continues for another half loop, recovering inverted, descends to normal flight level, flys 1 lap before Inverted Flight judging. Diagram #3. Errors: Loops rough, irregular (egg-shaped, hexagonal). Bottoms not at 4-6' height. Tops vary more than 2' plus or minus of 45° point. Second and 3rd loops vary more than 2' from path of first. Inverted Flight (2 Laps): Correct when makes 2 smooth, stable laps at normal level flight altitude. Diagram #4. Errors: Altitude not 4-6'. Altitude varies more than 2'. Consecutive Outside Loops (3 Req'd. 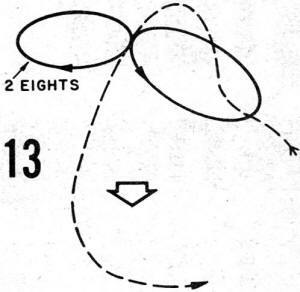 ): Correct when started inverted at normal flight level, makes 3 smooth, round loops, all in same place, with bottoms at normal level flight altitude, tops with line(s) at 45°. Continues for half loop, recovering in normal flight. Diagram #5. Errors: Loops rough, irregular (egg-shaped, hexagonal). Bottoms not at 4-6' height. Tops vary more than 2' plus or minus of 45° point. Second and 3rd vary more than 2' from path of first. Consecutive Inside Square Loops (2 Req. ): Correct when started from normal level flight, flies sqare course of 2 loops, each with 4 turns of approx. 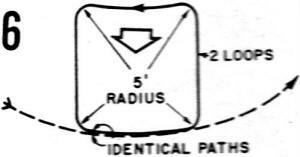 5' radius and straight, equal length segments, bottom segments at normal level flight altitude, top segments at 45°. Begins and ends in level flight at point of start of first turn. Diagram #6. Errors: Wobbles, mushes on turns. Lower altitude not 4-6'. Upper altitude not within 2' of 45° point. Turns not precise, exceed 7' radius. Sides not equal. Second not in same path. Consecutive Outside Square Loops (2 Req'd. ): Correct when started from level flight at 45° elevation, flies square course (starting with vertical dive) f 2 loops, each with 4 outside turns of approx. 5' radius and straight, equal length segments, bottom sements at normal level flight altitude, top segments at 45°. Begins and ends in level flight at point of start of first turn. Recovers into normal level flight within quarter lap. 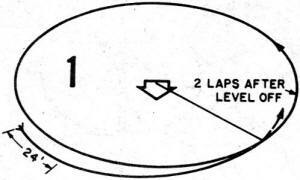 Diagram #7. Consecutive Inside Triangular Loops (2 Req'd. ): Correct when started from normal level flight, turns 120°, proceeds upward and backward to 45° elevation, turns 120°, flies downward to make another 120° turn into normal flight altitude, returning to starting point of first turn, flies identical 2nd loop in same path. Corners must be smooth, precise and approx. 5' radius. Diagram #8. Errors: Starts at other than 4-6' height. Turns rough, wobbly, or exceed 7' radius. Peak of 2nd turn not within 2' of 45° point. Sides wobbly, not equal in length. Second loop not in same path. 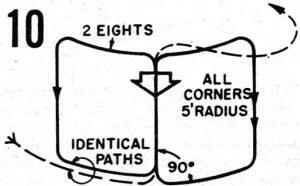 Horizontal Eights (2 Req'd): Entered at intersection point of circles, exit at same point. Either inside or outside loop may be flown first. Correct when model makes two eights, each 2 round circles or loops of same size, tangent to each other, in horizontal line. Model must enter 8 from normal flight, be vertical at intersection point of tangency of circles. Eights must be symmetrical. 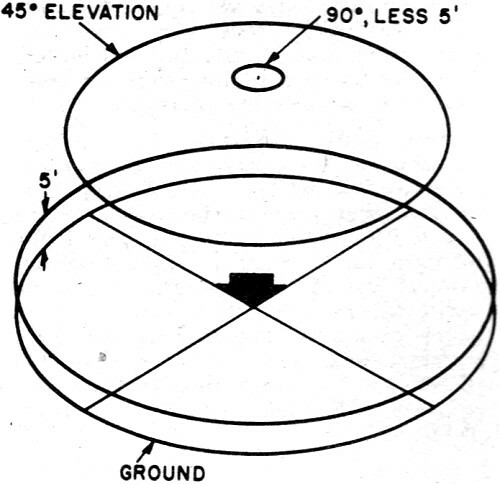 At top of each circle model must be at 45° point; bottoms of circles must be at normal flight altitude. 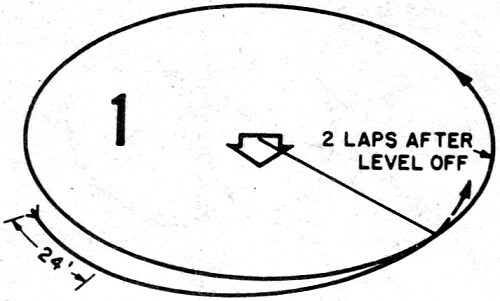 Diagram #9. Errors: Model not vertical at entry. 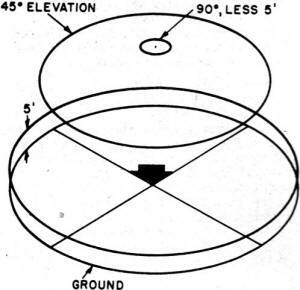 Top of circles not within 2' of 45° point. Bottoms not within 4-6' height. Not round, equal in size. Point of intersection varies. Second 8 not in same position. Square Horizontal Eights·(2 Req'd. ): Entered at intersection point of squares, exit after completion of two eights is made from same point. Either inside or outside loop may be flown first. Correct when model starts vertical climb, makes correct square cornered loop followed by reverse square cornered loop ending with vertical climb at same point. Maneuver repeated to form two eights. Tops of loops must be at 45°, bottoms at normal flight height, all corners smooth, precise approx. 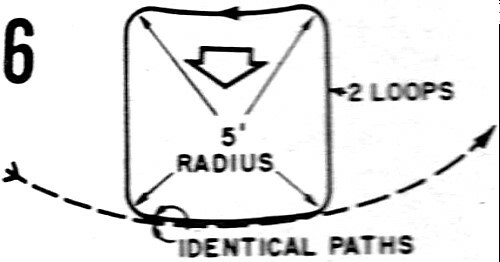 5' radius. Diagram # 10. Errors: Corners exceed 7' radius, sides not square and equal length. Loops not equal in size. Sides not square horizontally, vertically. Tops vary from 45° point more than 2': Bottoms not within 4-6' height. Point of intersection varies. Second 8 not in same position. Vertical Eights (2 Req'd. ): Entered at 45° point, exit from same point. Either inside or outside loop may be flown first. Correct when model makes two eights, each 2 round circles or loops of same size, tangent to each other, in vertical line. 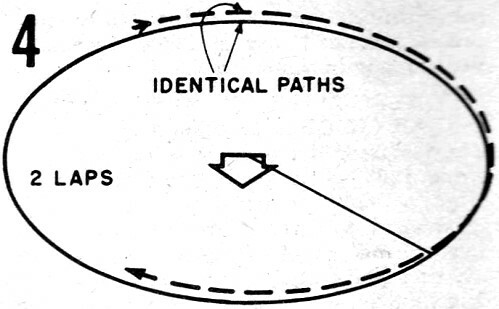 Enter in inverted flight, be horizontal at intersection point or tangency of circles. Eights must be symmetrical, tops at point 5' less than 90° directly above flyer's head, bottoms at normal level flight altitude. 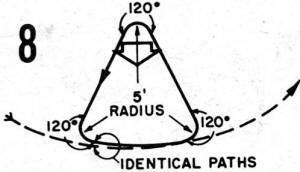 Diagram #11. Errors: Model not horizontal at entry. Entry not within 2' of 45° point. Tops of eights not 3-7' less than 90° point. Bottoms not at 4-6' height. 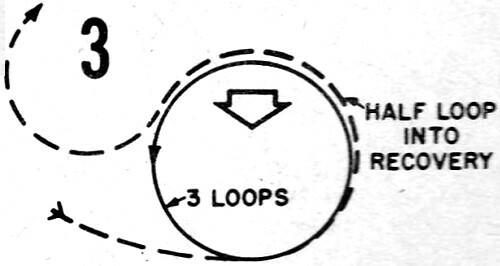 Loops not round, equal. Point of intersection varies. Second eight not in same position. Hourglass (1 Req'd. ): Correct when model starts from normal level flight, makes abrupt, smooth turn of 120° into inverted climb, turns 120° into level flight at altitude 5' less than 90° point above flyer's head, flies level distance of half total climb, turns 120°, dives at inverted angle to complete hourglass, recovers with 120° turn at point directly below upper left corner of figure, into normal level flight. 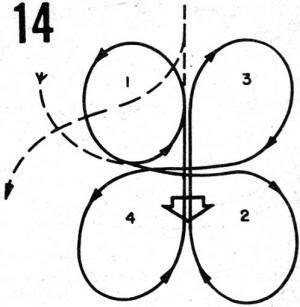 Flight paths of climb and dive cross at 45° point. Maneuver consists of two triangles, one directly above other, with segments of each triangle of equal length. 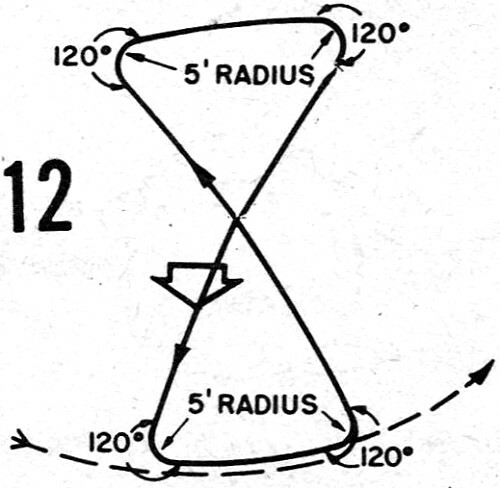 Diagram #12. Errors: Starts at other than normal level flight at 4-6' height. Turns rough, wobbly or exceed 7' radius. Top at an elevation 3-7' less than 90° . Triangle segments not equal length. 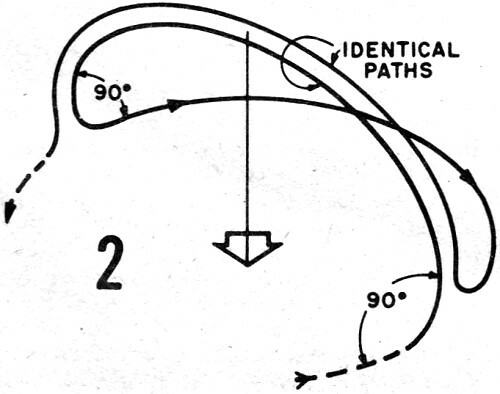 Termination of dive not directly beneath point where climb terminated. Recovery not at normal level flight altitude. Overhead Figure Eights (2 Req'd. 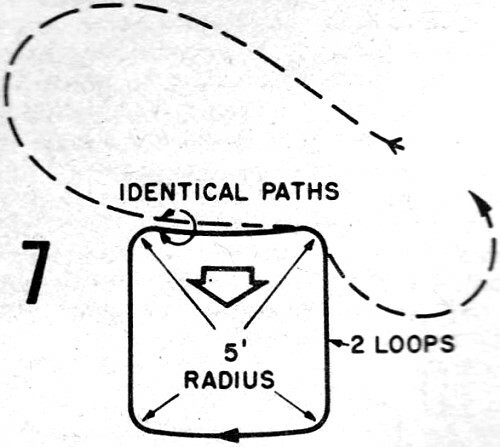 ): Entered at intersection point of circles, directly over flyer's head, exit from same point. Either inside or outside loop may be flown first. 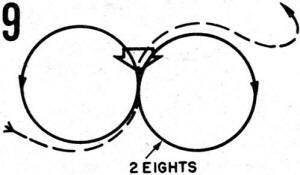 Correct when model makes two eights, each two round circles of same size, with intersection or point of tangency directly over flyer's head. 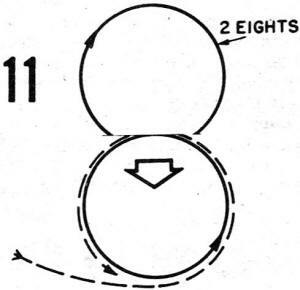 Model must enter eights with vertical climb through center of circle, must always point in this direction at, center of eights. Eights must be symmetrical, model at lowest point of each circle at 45° elevation. Diagram #13. Errors: Model not vertically overhead at entry. Low points of circles not within 2' of 45° point. 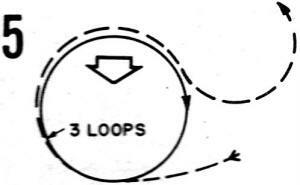 Loops not round, equal. Point of intersection varies. Second eight not in same position. Correct when model starts from 45° elevation point, performs inside loop (upper left), flies level distance equal to diameter of loop, completes three-fourths of outside loop (lower right), climbs vertically distance equal to diameter of first loop, completes. three-fourths of another outside loop (upper right), flies inverted distance equal to diameter of first loop, completes three-fourths of inside loop (lower left). 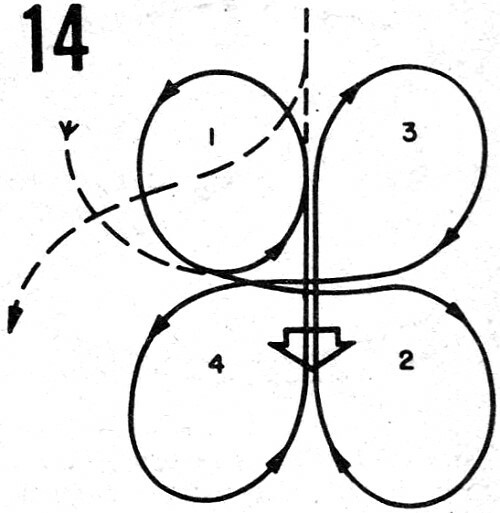 As tangency point between lower left and lower right loops is reached, model climbs vertically through four-leaf clover, recovers into normal level flight. Diagram #14. Errors: Entry not within 2' of 45° point. Loops rough, not equal. 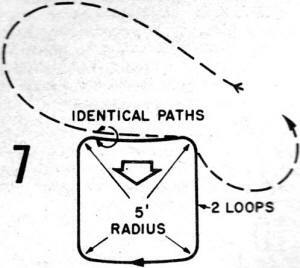 Paths connecting loops not properly horizontal or vertical according to maneuver sketch. Bottoms of lower loops not at 4-6' height. Tops of upper loops not 3-7' below 90° point over flyer's head. Loops not properly tangent to form square pattern. Model recovers before flying vertically through pattern. Landing: Correct when model lands smoothly with no bounce or unusual roughness, comes to stop without touching any part to ground other than landing gear. Wheel or 3-point landings permissible. Maximum, 40; Minimum, 0. Errors: Scored anytime model bounces or touches any part of model to ground other than landing gear. Crash, flipover, belly, upside-down landing receives no score. Any unusual circumstances surrounding above errors which may cause an error not within pilot's control will be judged accordingly.